Well the Roon implementation seems to have been in testing for quite a while, so they could always load that onto Darko’s demo pair. He wouldn’t be testing production software though, which may be contentious. I really must make some time to hear these soon; was going to do it at the end of last year but life keeps getting in the way of a day in London! True, i remember the review at 6moons. They had a pair that were Roon ready… this was quite a while ago. Darko, as you say could be given the same. You should Anthony. To go back to passive/conventional speakers after having the D&D8C is hard… not to say very expensive if you want to match the capabilities. This pair was not actually Roon Ready as the 8c firmware at the time was not fully developed for RAAT. Roon Ready status is officially given when Roonlabs have tested that all is working as expected. Remember that this is from September 2017. Both speakers are marked as ‘Uncertified’ and RAAT has also evolved much since then. It would be a bit silly if Darko tested RAAT which was not generally obtainable. I agree with you both. And like a said myself, i have the speakers, they are amazing and i can wait a little bit longer for Roon. But for upcoming buyers, i think Dutch and Dutch want them to be Roon ready for the review. I believe its a big usp. Ive had the Aurender N10, fantastic combination. Now Running them thru an Innuos Statement (not even closed to be boiled , 6 hours of 300h ish…) right now with the Mola Mola Tambaqui between (USB). I must say i prefer the sound of the D&D8C being fed with AES/EBU instead of analog XLR . But, ive heard that the D&D will sound “best” thru ethernet. I got them in dark wood with white front. Same for me. I’ve not bought a pair yet. A networked link from Roon to 8c would be a big plus. I could use my microRendu/Mutec combination to the AES input of the 8c, but the Roon route is cleaner. There is (according to Dutch&Dutch) a reclocker in the 8c so the Mutec might be redundant anyway. Did they say what type of reclocker ? My Statement uses OCXO for the ethernet and usb output to reduce jitter. I think the Dutch & Dutch will benefit from a cleaner signal. I´m not so sure your Mutec will be redundant. I hear the difference between different dacs connected via XLR or AES in to the D&D8C. Something that surprised me a little due to the extra conversion happening in the speakers. No, only that there is one. To keep things in sync this ‘master’ 8c delivers word clock to the other(s) in a group. The Roon Ready firmware seems to exist 13.14 and Dutch & Dutch is listed on the Roon Ready page. So I do not think the problem is with Roon, although I could be mistaken. I’m assuming it is with the updater. I asked D & D and they responded, politely, that they are working on it but can’t give a date. Mine are still 13.12 and Roon-less. The advantage of these types of speakers is that if the speaker or room sounds a little bright you can adjust them to sound a bit less bright. Absolutely true. But if one sounds better (to personal tastes/preferences) without the need for any adjustment, I’d probably go with that one. Ideally you’d love the luxury of hearing both (Kii3 and 8C) in your listening room at home. Next best case is in the same room at dealer, if you’re lucky to have a dealer that stocks both. He is reviewing them and got a pair with the V 13.14 firmware. Good news ! I believe its just at matter of time. They had some problem with the automatic firmware update module. This was exactly what i could do. Once again, both speakers are amazing and you should pick what ever sounds best in your ears. 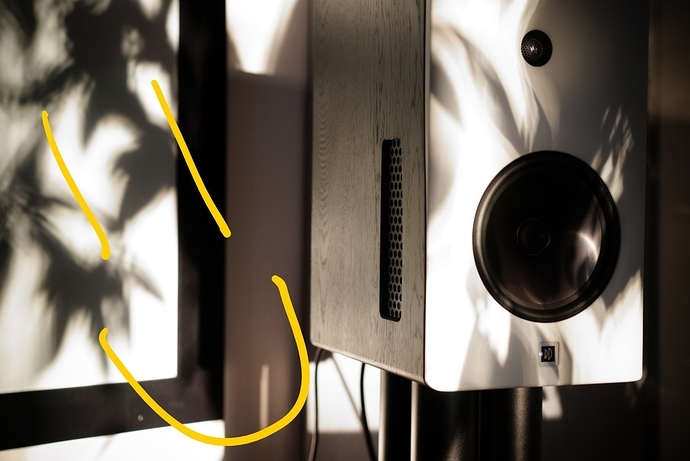 Tonality is one thing, they are different , but can be tweaked to sound close to similar (still different) BUT , the D&D8C is the more dynamic speaker and delivers a heavier punch. Bigger elements bigger cabinet. With the extra BXT + the Kii3 then yes, we are talking dynamic as h*** but will also set you back $$$$ more than the Dutch & Dutch. I remember when Martijn had a demo of the speakers at my local dealer. Mars 2018… we pressurized 60m2 with no problems. Great color combo. I didn’t know that combo was available. It’s not shown on their website. I’ve also been looking at the D&D 8Cs vs the Kiis. The Kii 3s digital inputs (with the Kii controller) are PCM 24/192 for S/PDIF and Toslink and PCM 24/384 & DSD128 for USB. If you use the analog input it will (I believe) convert back to digital in order to use it’s DSP processing. The D&D 8Cs can take analog or digital over XLR but what are the digital input specs for this connection? And what will be the inputs specs for Roon via LAN connection? And will the 8Cs also convert analog input back to digital for DSP processing or pass through without DSP? As far as I know it’s 96/24 over AES/EBU and 1924/24 over LAN. As far as I know it can convert analog back to digital, I have not done this though. As far as I know it’s 96/24 over AES/EBU and 1924/24 over LAN.